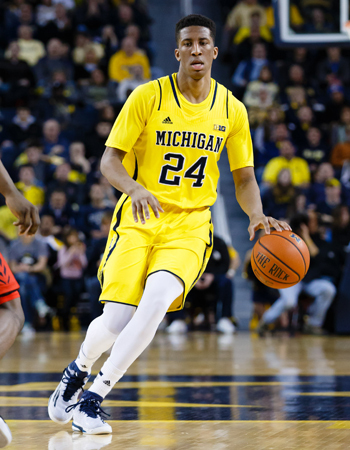 Jacob breaks down Aubrey Dawkins, a 6-6 sophomore wing for the Michigan Wolverines. Aubrey Dawkins came to Ann Arbor as an afterthought in the 2014 recruiting class for John Beilein’s Wolverines. Though his father – Johnny – is a highly respected figure in the college game as the head coach of Stanford, Aubrey was a lightly touted three-star recruit, struggling to garner attention from schools outside the Atlantic 10. Michigan offered a scholarship exceedingly late in the process and he accepted shortly thereafter. Through his first 12 games as a Wolverine, Dawkins averaged barely five minutes per game and attempted only two three-point attempts. By the season’s end, thanks to the injury suffered by starting SG Caris LeVert, he had established himself as a starting wing and a sharpshooter for Michigan. Dawkins has good size at 6’6 and 205 pounds, and has reportedly added more strength to his frame this summer. His size and improving frame, coupled with the fact that he’s an explosive athlete with impressive leaping ability and nice speed in the open floor, gives him a nice package of physical tools looking to the next level. Skill wise, Dawkins is an excellent shooter who changed his mechanics midway through last season to speed up his release and lower the arc of the ball – both of which helped increase his shooting efficiency. Dawkins’ confidence grew with his playing time and he got his opportunity to prove himself early as the Wolverines dealt with a slew of injuries to key rotation players. By January, with star Caris LeVert sidelined with a foot injury, Dawkins hit his stride. After scoring .38 points per jump shot attempts 1 per game during Michigan’s non-conference schedule, the freshman scored a tremendous 1.26 over 4.1 attempts per game as he became a regular starter. Given his torrid shooting down the stretch, it will be interesting to see how Dawkins fares in a larger role as a sophomore. Unsurprisingly given his sudden and dramatic development, Beilein named Dawkins as the team’s most improved player and noted as recently as early September that he was especially impressed by how much Dawkins continued to improve over the summer. At this point, though, Dawkins is a largely a one-dimensional shooter. He’s an ace from the perimeter, but is otherwise quite limited elsewhere on the offensive end. Often times Dawkins will set up in the corner and have a wide open lane for a backdoor cut, which he’ll choose to ignore opting to hunt jump shots out on the perimeter. Given his shooting ability, teams tended to overplay him on the perimeter, but that didn’t result in more opportunities for him inside. He shies away from taking the ball to the basket, as only 21.6% of his field goal attempts came around the rim in conference play, and doesn’t embrace contact on the occasions he does venture in close, getting to the free throw line just 23 times last season. Dawkins doesn’t make much as impact as a passer either, averaging a miniscule 0.7 assists per-40 minutes as a freshman and seldom looking to create for himself or teammates off the dribble. According to our database, his 4.1% assist rate makes him the least prolific distributor of any wing prospect in the nation. To put things simply: he emerged spot-up shooter as a freshman who, while extremely dangerous from behind the arc late in the year, offered very little else for his team offensively. Defensively, Dawkins has the athleticism and length to succeed but often finds himself defending out of position. He’s guilty of over-helping and gambling when he’d be better served staying at home on his opponents on the perimeter. Too often Dawkins tries to compensate for bad positioning with his length, only to fail to recover to the ball when his man find an opening, not always using his athleticism effectively defending off the ball. To his credit, he’s absolutely comfortable when defending in isolation matchups and can improve on most of his defensive issues in time. When switched onto big men on the interior, he’s overmatched physically but battles and uses his length to try to make things difficult. With the added weight he’s put on over the summer, he might become an acceptable stretch-four in desperate situations for Michigan depending on the matchup. The physical talent is there for Dawkins to become a capable 3-and-D player. Overall, this is an important season for Dawkins to show he’s capable of adding dimensions to his offensive game. While his shooting suddenly became elite last season and his athletic ability is very impressive, he still has a ton of room for improvement on both ends. Still, in what figures to be a bounce back year for Michigan, Dawkins should play an integral role.